We had the usual things in our Pascha basket. You know, bacon, red eggs, salt, cheese, hrutka cheese, Pascha bread, wine, a butter lamb, and chocolate. Then we had some Colorado love. Well, actually New Mexico, but still like back home--so close enough. Abouna Moses from Holy Resurrection in Wisconsin had driven through New Mexico late last year and loaded up on a ridiculous amount of New Mexico green chile, something I miss profoundly since moving to the hinterlands of the north. Abouna is one of those people who instantly becomes everyone's friend and knows how to make them at home. He had me pegged from the first time that I met him. The way to my heart is always food and cooking. We saw him and Jessica from Every Home a Monastery in the last week of March, right after Western Easter, because our kids' school was on break. Since Ben teaches, we have to take advantage of these days off. God bless Abouna! When we went back home, we brought with us his homemade bacon, European butter, and chiles he had roasted himself. I have a love affair with green chiles. When we first moved here, I was shopping and sending kids in all directions to fetch things in different parts of the store. I sent the oldest, then nineteen, to get green chiles, which is properly pronounced "chee-LAYS". When he couldn't find them, he asked a clerk. Three times Joseph tried to tell him what he wanted. Finally he took Joey to the shoe department, which kind of freaked him out a little bit. Once there, he showed Joey some green shoelaces. I am not even kidding! Joey laughed and thanked him and then found me. I didn't laugh long. No chiles. Like none. Now real, whole, raosted green chiles from home make me cry. Growing up in Denver, I love the smell of chiles. The whole west side of the city smells like roasting chiles all August. the trucks come up from southern Colorado or New Mexico, full of glossy green chiles. The Mexicans and Mexican-Americans sell them all along Federal Boulevard. They have blow torches and giant metal spinning baskets that like the ones from the Bingo halls also all up and down Federal Boulevard. They ask how many bushels you want and then they are dropped into the basket and while it is spinning, they are roasted by the fire from a blow torch. I love this. I love the heat and the smell of chiles and sound of the skin crackling. I miss it so much that I literally weep for it in August. I miss it so much it is a painful stabbing feeling in my throat when I think about it. I am so blessed to have so many beautiful friends that every fall, someone buys a large box and fills it with unroasted chiles (so they can be shipped). Getting a box like this makes home feel a little less far away. So I take my chiles outside and we fire up the grill with hardwoods from the trees here at the farm and we roast them over oak or maple. It is the strange fusion of here and there, of now and then, of my husband and of me. At Pascha, we had chiles in the basket which confused the priest. I told him that even though these were Lenten, it represented something I missed profoundly, something my children miss profoundly, something that we needed. Last night I made deep fried chiles rellenos and a green chile sauce. Since one of my kids is allergic to tomatoes, I used whiskey soaked raisins instead and it was amazing. I will totally do that going forward. Father Alexander and Brother Anthony came over and we had plates piled high with rice, rellenos (plain cheese ones for the little people), green chile sauce, and sour cream. Father brought wine and we talked and laughed. These chiles were so hot that our faces were red, we were sweating, and our eyes were watering and had to pause between bites. It hurt a bit but in a good way. The best way, really. I was completely in the moment. I did not take even one picture, I did not even knit a single stitch. It was nice to put aside everything for a little while and just enjoy the food and the wine and the company while the little children ran in and out of the big farm kitchen. I think that is the Christian journey. Yesterday, some friends were chatting over Facebook about needing to introduce some veggies and fruits back in after a few days of feasting. One of them said the other option was to eat through the pain. That is pretty much what we did last night. We ate through the pain both literally and figuratively. I am not sure that the place I live could ever really be home to me but it certainly is the place God had put me. When I miss home, I bring it out in my kitchen, but in this kitchen here on the farm. Eating chiles for me is eating through the pain and I come out on the other side happier even if I cry up until that moment. In the end, I think that is the Christian journey. Eat through the pain. The other side is there, waiting, and it will be bliss even if every moment between then and now is bound up in the physical, a mixture of tears and joy. And if you are experiencing any, um, slowed digestion because of all the cheese you have been eating, drop on by my house. I have some leftover chile sauce. That'll clear that right up for you, Compadre. It was so good. My Eli asked what I wrote about and I told him and he laughed saying, "It was so hot I didn't think I could eat it but it was so good that I couldn't stop!" It was amazing. Really. I needed that. Love this! Chile Rellenos sounds so good right now! We miss the smell of chiles roasting across the city too. I can relate so much to this post. Thank God for your whole family. You make the North Woods a whole lot better! Sounds delicious...I love the addictive, endorphin rush of hot chiles! Papaya chewable tablets help so much when breaking the fast. They are sooo necessary! When my family does not want to take them, they always regret it! I buy a TON Holy Week so that we are ready! Melissa, if you don't mind me asking, when did you convert to Orthodox? I thought you were Roman Catholic when you lived here in Denver? That green chile sounds amazing. I never would have thought of using raisins to substitute for tomatoes. Very clever! We were Ukrainian Greek Catholic and our kids had godparents who were Roman NO, Roman TLM, and UGCC. There is a lot of flux between the TLM and DL back home. Or at least there used to be; it seems to be less now than twenty years ago. After moving to the Keweenaw we divided our time between the Ukrainian Catholic Skete and the Russian Orthodox Mission. It was three years of discernment but we were received this year on Lazarus Saturday. It was a painful process but we are happy now that we are on the other side. God is good. As for the raisins, they were left over ones from doing a GIANT amount for cheese and they were marinating in the fridge. It gave the chile the base notes that it needed and it was so dang good. I have missed tomatoes so much and finding things that work so well like this makes it feel so much better. We'd love to hear your conversion story. Yes, we would also love to hear your conversion story, and why you left the Byzantine to go to the Orthodox. We are Traditional RC, but have attended the Byzantine Church many times and just love the Liturgy. 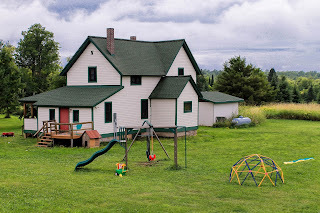 We live down state and have been thinking about buying a hobby farm in the Keweenaw. We have home educated our children for over 20 years. We were looking at the Byzantine Monastery to attend, if we move up there, but have recently been looking into the Orthodox Church. Our family would be considered very traditional/conservative. It would be wonderful to know, first hand, why you chose the Orthodox Church over the Byzantine? Thanks so much! I'm also trad catholic. Interested in Orthodox. But I can't get past that the orthodox allow contraception and divorce and don't believe in hell. It is difficult to eat something when we suffer with pain. We can cook light food that can be useful for us. Chile is best for all and people like the good taste of chile. We can make different light dishes which we can eat easily. I can so relate to this missing the food of "home!" When we moved here, eight and a half years ago, we were able to go back "home" in November the first couple years. So, I was able to buy the good chocolate treats for the kids' stockings. The third or fourth year, we couldn't. I cried because I couldn't even provide good candy for them for Saint Nicholas. There are no Middle Eastern markets here, the price of rose water is insane, and tahina, when it can be gotten, is rancid. I buy it when I go elsewhere.